His fingers twined round the animal’s neck; then, with a sigh, he rose and took a turn or two on the jetty. 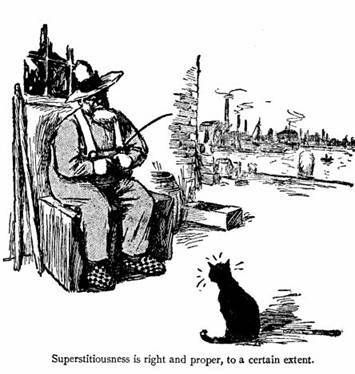 Superstitiousness is right and proper, to a certain extent, he said, resuming his seat; but, o’ course, like everything else, some people carry it too far—they’d believe anything. Weak-minded they are, and if you’re in no hurry I can tell you a tale of a pal o’ mine, Bill Burtenshaw by name, that’ll prove my words. His mother was superstitious afore ‘im, and always knew when ‘er friends died by hearing three loud taps on the wall. The on’y mistake she ever made was one night when, arter losing no less than seven friends, she found out it was the man next door hanging pictures at three o’clock in the morning. She found it out by ‘im hitting ‘is thumb-nail. For the first few years arter he grew up Bill went to sea, and that on’y made ‘im more superstitious than ever. Him and a pal named Silas Winch went several v’y’ges together, and their talk used to be that creepy that some o’ the chaps was a’most afraid to be left on deck alone of a night. Silas was a long-faced, miserable sort o’ chap, always looking on the black side o’ things, and shaking his ‘ead over it. He thought nothing o’ seeing ghosts, and pore old Ben Huggins slept on the floor for a week by reason of a ghost with its throat cut that Silas saw in his bunk. He gave Silas arf a dollar and a neck-tie to change bunks with ‘im. When Bill Burtenshaw left the sea and got married he lost sight of Silas altogether, and the on’y thing he ‘ad to remind him of ‘im was a piece o’ paper which they ‘ad both signed with their blood, promising that the fust one that died would appear to the other. Bill agreed to it one evenin’ when he didn’t know wot he was doing, and for years arterwards ‘e used to get the cold creeps down ‘is back when he thought of Silas dying fust. And the idea of dying fust ‘imself gave ‘im cold creeps all over. Bill was a very good husband when he was sober, but ‘is money was two pounds a week, and when a man has all that and on’y a wife to keep out of it, it’s natural for ‘im to drink. Mrs. Burtenshaw tried all sorts o’ ways and means of curing ‘im, but it was no use. Bill used to think o’ ways, too, knowing the ‘arm the drink was doing ‘im, and his fav’rite plan was for ‘is missis to empty a bucket o’ cold water over ‘im every time he came ‘ome the worse for licker. She did it once, but as she ‘ad to spend the rest o’ the night in the back yard it wasn’t tried again. Bill got worse as he got older, and even made away with the furniture to get drink with. And then he used to tell ‘is missis that he was drove to the pub because his ‘ome was so uncomfortable. Just at that time things was at their worst Silas Winch, who ‘appened to be ashore and ‘ad got Bill’s address from a pal, called to see ‘im. It was a Saturday arternoon when he called, and, o’ course, Bill was out, but ‘is missis showed him in, and, arter fetching another chair from the kitchen, asked ‘im to sit down. Silas was very perlite at fust, but arter looking round the room and seeing ‘ow bare it was, he gave a little cough, and he ses, “I thought Bill was doing well?” he ses. “So he is,” ses Mrs. Burtenshaw. “I suppose he likes room to stretch ‘imself about in?” he ses, looking round. Mrs. Burtenshaw shook her ‘ead. Silas Winch scratched his head and looked at ‘er thoughtful-like. Mrs. Burtenshaw got so excited at the idea she couldn’t ‘ardly speak, but at last, arter saying over and over agin she wouldn’t do such a thing for worlds, she and Silas arranged that he should come in at about three o’clock in the morning and give Bill a solemn warning. She gave ‘im her key, and Silas said he’d come in with his ‘air and cap all wet and pretend he’d been drowned. “It’s very kind of you to take all this trouble for nothing,” ses Mrs. Burtenshaw as Silas got up to go. Mrs. Burtenshaw shut the door arter ‘im, and then she went in and ‘ad a quiet sit-down all by ‘erself to think it over. The only thing that comforted ‘er was that Bill would be in licker, and also that ‘e would believe anything in the ghost line. It was past twelve when a couple o’ pals brought him ‘ome, and, arter offering to fight all six of ‘em, one after the other, Bill hit the wall for getting in ‘is way, and tumbled upstairs to bed. In less than ten minutes ‘e was fast asleep, and pore Mrs. Burtenshaw, arter trying her best to keep awake, fell asleep too. 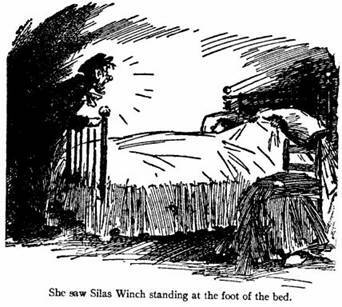 She was woke up suddenly by a noise that froze the marrer in ‘er bones— the most ‘art-rending groan she ‘ad ever heard in ‘er life; and, raising her ‘ead, she saw Silas Winch standing at the foot of the bed. He ‘ad done his face and hands over with wot is called loominous paint, his cap was pushed at the back of his ‘ead, and wet wisps of ‘air was hanging over his eyes. For a moment Mrs. Burtenshaw’s ‘art stood still and then Silas let off another groan that put her on edge all over. It was a groan that seemed to come from nothing a’most until it spread into a roar that made the room tremble and rattled the jug in the wash-stand basin. It shook everything in the room but Bill, and he went on sleeping like an infant. Silas did two more groans, and then ‘e leaned over the foot o’ the bed, and stared at Bill, as though ‘e couldn’t believe his eyesight. “Try a squeaky one,” ses Mrs. Burtenshaw. Silas tried five squeaky ones, and then he ‘ad a fit o’ coughing that would ha’ woke the dead, as they say, but it didn’t wake Bill. “Now some more deep ones,” ses Mrs. Burtenshaw, in a w’isper. Silas licked his lips—forgetting the paint—and tried the deep ones agin. “Now mix ‘em a bit,” ses Mrs. Burtenshaw. 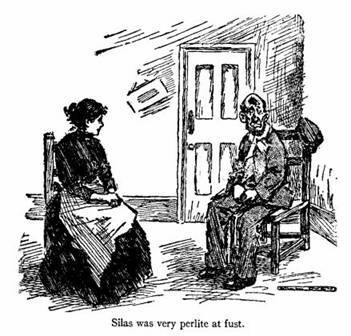 Mrs. Burtenshaw pretended to be asleep, and Bill was just going to turn over agin when Silas let off another groan. It was on’y a little one this time, but Bill sat up as though he ‘ad been shot, and he no sooner caught sight of Silas standing there than ‘e gave a dreadful ‘owl and, rolling over, wropped ‘imself up in all the bed-clothes ‘e could lay his ‘ands on. Then Mrs. Burtenshaw gave a ‘owl and tried to get some of ‘em back; but Bill, thinking it was the ghost, only held on tighter than ever. “Bill!” ses Silas Winch, in an awful voice. “Good-by,” ses Bill, in a voice all smothered with the bed-clothes. Silas Winch groaned agin, and Bill, as the shock ‘ad made a’most sober, trembled all over. Afore Silas could answer, Mrs. Burtenshaw, who felt more comfortable, ‘aving got a bit o’ the clothes back, thought it was time to put ‘er spoke in. Bill put his ‘ead up and looked, and then ‘e gave a dreadful scream and dived under the bed-clothes agin. “Yes,” ses Bill, with a groan of his own. “I ‘ave looked,” ses Bill, with his ‘ead still under the clothes. “Not—not as medicine?” ses Bill, holding the clothes up a bit so as to be more distinct. Bill Burtenshaw put ‘is arm up and swore it. Then ‘e took ‘is arm in agin and lay there wondering wot was going to ‘appen next. “I should ‘ave given ‘er fifteen shillings a week,” ses Silas. “‘Ow much?” ses Bill, nearly putting his ‘ead up over the clothes, while ‘is wife almost woke up with surprise and anger. Bill did as ‘e was told, and then ‘e lay and trembled, as Silas gave three more awful groans. Bill said “Good-by,” and arter a long silence he ventured to put an eye over the edge of the clothes and discovered that the ghost ‘ad gone. He lay awake for a couple o’ hours, wondering and saying over the address to himself so that he shouldn’t forget it, and just afore it was time to get up he fell into a peaceful slumber. His wife didn’t get a wink, and she lay there trembling with passion to think ‘ow she’d been done, and wondering ‘ow she was to alter it. 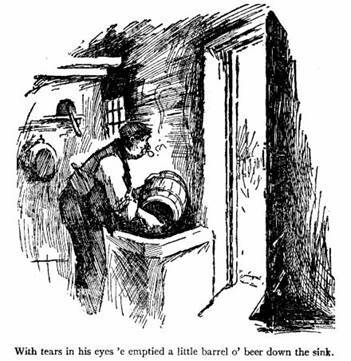 Bill told ‘er all about it in the morning; and then with tears in his eyes ‘e went downstairs and emptied a little barrel o’ beer down the sink. For the fust two or three days ‘e went about with a thirst that he’d ha’ given pounds for if ‘e’d been allowed to satisfy it, but arter a time it went off, and then, like all teetotallers, ‘e began to run down drink and call it pison. The fust thing ‘e did when ‘e got his money on Friday was to send off a post-office order to Shap Street, and Mrs. Burtenshaw cried with rage and ‘ad to put it down to the headache. She ‘ad the headache every Friday for a month, and Bill, wot was feeling stronger and better than he ‘ad done for years, felt quite sorry for her. By the time Bill ‘ad sent off six orders she was worn to skin and bone a’most a-worrying over the way Silas Winch was spending her money. She dursn’t undeceive Bill for two reasons: fust of all, because she didn’t want ‘im to take to drink agin; and secondly, for fear of wot he might do to ‘er if ‘e found out ‘ow she’d been deceiving ‘im. She was laying awake thinking it over one night while Bill was sleeping peaceful by her side, when all of a sudden she ‘ad an idea. The more she thought of it the better it seemed; but she laid awake for ever so long afore she dared to do more than think. Three or four times she turned and looked at Bill and listened to ‘im breathing, and then, trembling all over with fear and excitement, she began ‘er little game. “W-w-wot’s the matter?” ses Bill, beginning to wake up. Mrs. Burtenshaw didn’t take any notice of ‘im. Bill, wot was just going to ask ‘er whether she ‘ad gone mad, gave a awful ‘owl and disappeared right down in the middle o’ the bed. She began to gasp and sob, and Bill began to think wot a good wife he ‘ad got, when he felt ‘er put a couple of pillers over where she judged his ‘ead to be, and hold ‘em down with her arm. “Has it gorn?” ses Bill, agin. Bill came up very slow and careful, but with ‘is eyes still shut. “Yes, Bill,” ses ‘is wife. Mrs. Burtenshaw took out the end of the sheet wot she ‘ad stuffed in ‘er mouth when ‘e began to speak. 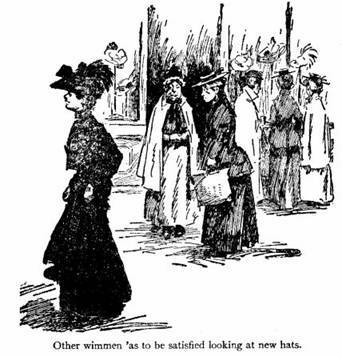 Bill Burtenshaw gave ‘er the fifteen shillings next morning and every Friday night arterwards; and that’s ‘ow it is that, while other wimmen ‘as to be satisfied looking at new hats and clothes in the shop-winders, Mrs. Burtenshaw is able to wear ‘em.